KB Sigal Prishtina won the Balkan League for second year in a row. In a great final in Bar tonight the championst lost to KK Mornar 68-75 but due to the 14-point win in the first game lifted the trophy. Both teams offered a great game, filled with tense moments and very good runs from both sides. Mornar fought very hard and even took a 13-point advantage early in the fourth quarter but couldn′t hold on to it. Nevertheless it was a spectacular end to a great season as two very good teams battled for the title at the end of it. It was a very good start for the hosts who took a quick 10-4 lead. In the next minutes they continued to be aggressive and managed to stay in front as after a Marko Mugosa triple at the buzzer, the first quarter finished with 8-point advantage for Mornar. Sigal started better the second as Dardan Berisha and Edmond Azemi sparked the visitors. The cut the deficit to 4 and then Lamont Jones answered with a triple. Sigal however scored the next 10 points to take its first lead of the game and then the score was tied twice. The visitors though made the last four points of the first half and led 39-35 after 20 minutes. The second half started with Mornar trying to comeback but when the team cut the deficit to 1 Sigal responded to go up by 6 after a Marinov lay-up with 2.30 played in the quarter. From this moment on Mornar turned the things and locked their basket for the next 7 minutes. In that time the hosts made a 14-0 run to go up by 9 as Jason Washburn finally scored a free throw for the visitors with 33 seconds to go. 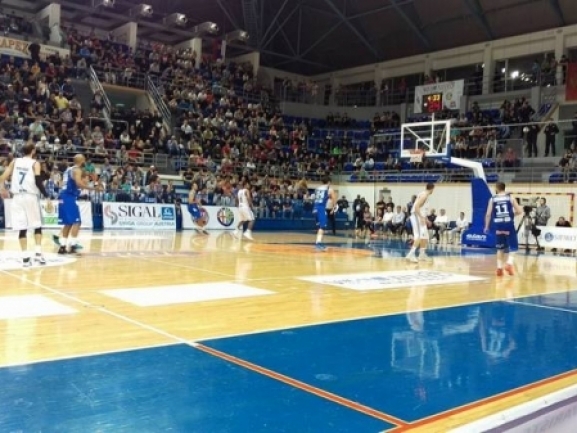 In the next offense Sampson made a put back andd after Sigal didn′t score, Mornar was up by 10 after 30 minutes. Damjanovic hit a triple to start the fourth quarter and bring the hosts down to only a point in the overall tie. Sigal though immediatelly responded with 7 quick points and later the deficit went down to 4. Mornar however didn′t stop fighting and after Lopicic dunked with 3.46 to go, the difference went up to 11 points. Then both teams missed twice and Washburn got fouled with 2.20 to play and made the two free throws. Mornar missed its next offense as well and after Washburn scored two more free throws and Sampson again didn′t score, the overall winner was decided. In the final 90 seconds the hosts held on for the win but the points difference just wasn′t enough. Lamont Jones was the top scorer for Mornar with 22 points as Balsa Radunovic added 20 and 6 rebounds. Jason Washburn had another double-double for Sigal with 24 points and 11 rebounds while Dardan Berisha came up with 15 points.